Model T Ford Forum: Heed Their warning! Model T Ford Forum: Forum 2014: Heed Their warning! I own two Model T's a 1922 Coupe and a 1927 Touring. I am still considered a newbe only owning Model T's for 10 years but I must speak up and tell other newbes to heed the warning of the experienced Model T owners. I've read several threads that always warn you not to trust what the seller told you about your Model T and ALWAYS CHECK THE REAR END for proper thrust washers. Well I'm here to say follow the advice of the long time Model T owners! I purchased the 1927 Touring about 4 years ago and was told that it was their Dads favorite Model T and he had everything rebuilt on it because they used it in a lot of parades and Sunday drives. Well I've been running it alot since I bought it and it always prayed on my mind about tearing down the rear end and checking it to be sure it was safe. Well today I finally had the time to open up the rear end and I shocked to find nothing but ground up Babbit in the pumpkin. I took the last owners word for what was done even after reading all the warnings I kept driving it. BOY AM I LUCKY. So I guess I'm here to say to all those who have purchased a Model T and have not looked into the rear end to know exactly what is in there DO IT NOW! I could have hurt someone if the rear end would have failed. Please take time to be sure. I wouldn't drive a T without a good handbrake. I think the key is to ask lots of direct and pointed questions and ask for proof. I went and looked at a 1919 Touring an older gent had up for sale early last spring. He assured me that the car was "all rebuilt and gone through", as well as being a frame-off restoration. But when I pointed out that the rear end was obviously leaking and showed no signs of ever being touched, then asked for documentation of what exactly was done in the engine, all I got was the same story. As far as the frame-off claim goes: I pointed out the cracking in between the paint on the fenders and the paint on the body indicated that it had never been torn down. He stuck to his story. So after exchanging a few more pleasantries, I politely told him I didn't feel comfortable making him and offer and left. By the way, it's still for sale. When you buy a T, there are lots of things that can be wrong with it that the seller may or may not have mentioned, but it can still be driveable. 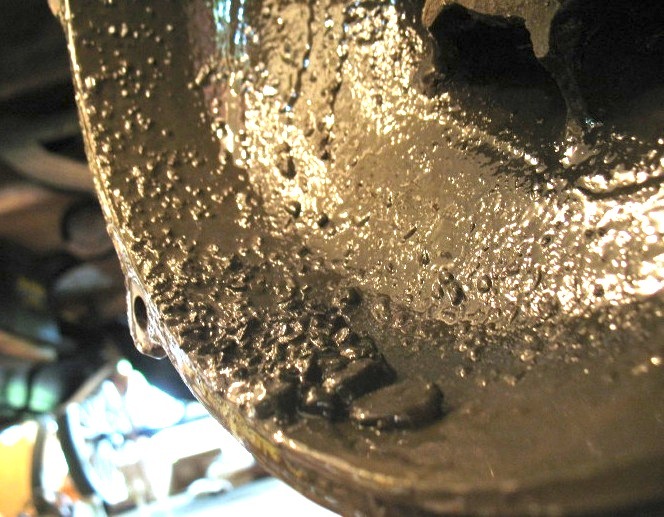 Worn bands, noisy engines, old tires, etc., can be a nuisance, but not generally huge problems otherwise. 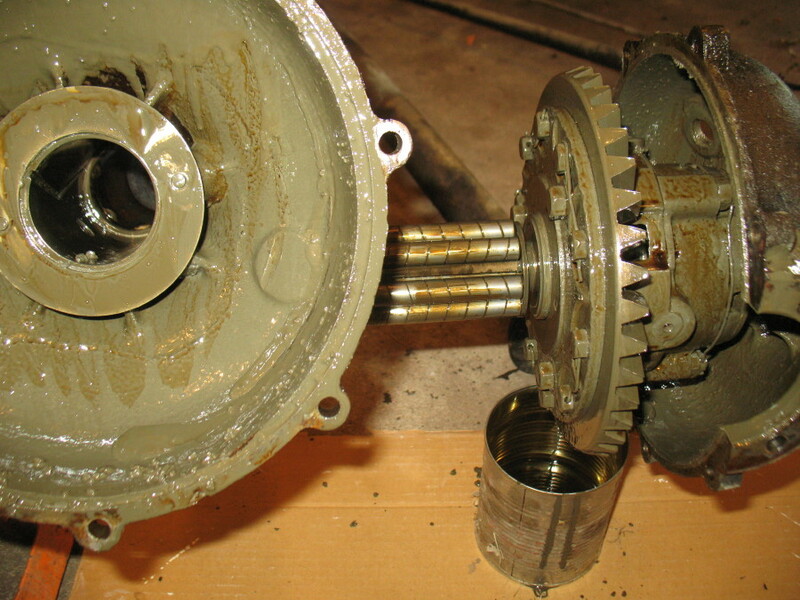 However, babbitt thrust washers in the differential can make a drive go from good to bad, and even dangerous, VERY quickly. Not only can you lose your gear mesh completely and render engine braking and the brake pedal useless, but the axles sliding in and out have a nasty habit of destroying the brake shoes, turning the hand brake lever into just a hand lever. I feel that the differential is one of those frequently overlooked components since it typically gives so little trouble when reworked properly, but it is CRITICAL that the babbitt thrust washers are replaced with new bronze ones. At least that's something that all of us on the forum can agree on. Replace those babbitt thrust washers ASAP!!! If I buy a T I assume Dad or Grandpa didn't have a clue, and I'm going to have to fix a lot of what they did. How do I know this? Experience, boys and girls. I'll go one step further. I bought a 1914 touring "ground up restoration" from the collection of the owner of the major Ford dealership in our area. Restored by the best restorer in our area, if not the country, no cost spared. I talked myself into believing everything had to be OK. . .look who the owner and restorer were. And it had Rocky Mtn brakes! Only after I was involved in a major accident on a 22% grade, the engine stalled, and I couldn't stop the car from rolling backwards down the hill, did I have the car torn apart. No brake band, no brake shoes (drums, but no shoes). The emergency brake lever (that I fooled myself into thinking worked) wasn't even attached. Very lucky we weren't killed. After it was torn apart, found a number of other things that weren't as they were supposed to be, including the babbitt thrust washers. I'm very lucky I had this accident before I drove it long enough to have a more serious accident. Don't trust anyone about what was "done" to the car. Believe Steve Jelf's assumption! While new to the T scene, I have been doing old cars now for just shy of 40 years. and then plan on doing EVERYTHING to it to bring it up to par. life, how much are they really worth ? me and my dream car and a smile all the way. Why would anyone do it any other way ? Those photos you posted could have been taken in my shop last night. That is exactly what the rear end looks like. Safety items should be the first thing we check/repair when we buy a "new" T. Imagine taking your grand kids or other loved ones for a ride and having a disastrous accident. Not a legacy I want to leave behind. So inspect that hand brake, rear end, steering components, wheels, tires, spokes, front wheel bearings, etc. BEFORE you leave your driveway for the first time. Making it go is good, but making it stop and go where you want is better. Have I left out anything crucial to safety? somewhere in my junk is the receipts of parts I bought. If I was to sell 1 of my piece together T's it would be at least obvious to the new owner judging by the paper work that i had put in bronze washers. I feel like it is a good idea to keep paper work,but keep it where you could find it! I could not tell ye where mine is at the moment. I guess the reason some of us have half measure cars is that is about all we can muster budget wise.But safty is not something to budget on.dont drive it till it can be stopped. Dennis, I'm glad to hear you dodged a bullet! I think the trouble with most new T owners, myself included, is the "fear" of taking that "big ol' rear end/drive train" out from under the car, opening it up, dealing with the mess, etc. Well, once I got the gumption, after noticing some end-play on one of my wheels of my first T, the '20 Runabout, it turned out to be not that bad at all, and actually pretty fun to do! That said, as soon as I had a decent day the winter I got my second T, the '15, I immediately took it apart just to verify the thrust washers, and subsequently replace a bent axle shaft. And this fall I just finished the same on my third T, the '12, mainly because I couldn't stand it peeing the black drops under the pumpkin. Fixed some hidden issues, the gaskets, fresh oil, and now the floor under it staying dry! All is good. Wow Dennis that was quick!..great job. Did you need to replace anything other than the thrust washers? Good advice Seth about checking out the rear end on your T.
In this era of driving our "modern" cars we tend to not think of checking them out as much. We need to remember our 100 year old cars need tender love and care more than our newer ones. Just since you replaced the thrust washers with the new bronze ones does no mean it will last forever. About 20 years ago, I replaced the babbit thrust washers in my 1921 center-door T. It was not long after the repair that I noticed some noise out of the rear end. I checked the oil level in the rear end and it looked very "golden" in color. I jacked up the rear end and found that the wheels had a lot of in and out movement. I could not find anything that I had done wrong, so I replaced the broken washer and that was about 20 years ago. After many tours, it is still going great.